It’s a super-fun day here at THK! Well, let’s be honest. Every day is a super-fun day at THK. But today is a super-dee-duper, fantastically awesome day! Why? Because we’re celebrating our birthday!!! Our anniversary! Our … blogiversary! It seems like only yesterday we held our breath and counted 3 … 2 … 1 … and then pushed “Publish” on our very first post, while screaming like little girls. Wow – that was two whole years ago! And weren’t we just sharing cake for our first birthday?? On that very first-ever day of THK, after we got done jumping up and down and dancing around Gretchen’s kitchen, we headed to our fave local Mediterranean restaurant for a celebratory lunch together. It was a gorgeous day, and we dined out on the patio, soaking up some sun and enjoying our lunches (while secretly wondering if our site was doing ok – Gah! – we weren’t babysitting it!). We both love that restaurant, and so do our families. The food is always fantastic – bursting with healthy, fresh Mediterranean flavors. We just knew it was the perfect spot to celebrate the launch of our new healthy eating site! Any time we eat there, we both always, always order the hummus and tabouli as appetizers. It’s like “the rule” when you go there … Start meal with hummus and tabouli. Delicious! At first, you kinda take small helpings of each, and daintily nibble at the hummus, and then take little bites of the tabouli. But while each is fabulous on its own … it’s mind-blowing when they’re mixed together. That’s exactly how we celebrated our incredibly exciting day two years ago! 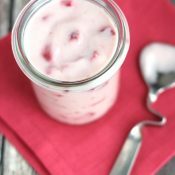 So what better recipe to share with you today than an (easy peasy!) 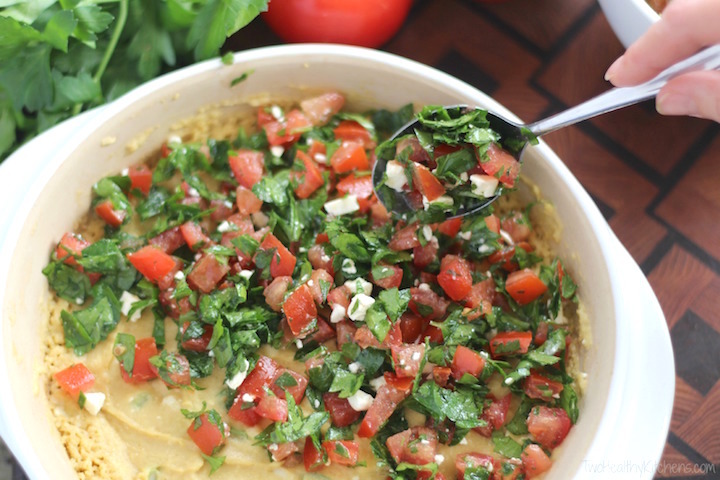 take on our favorite-fave mixture of hummus and tabouli?! We’ve been dreaming about a baked hummus dip ever since our Top 10 Healthy Hot Appetizer Dips and the Feta-Baked Hummus. 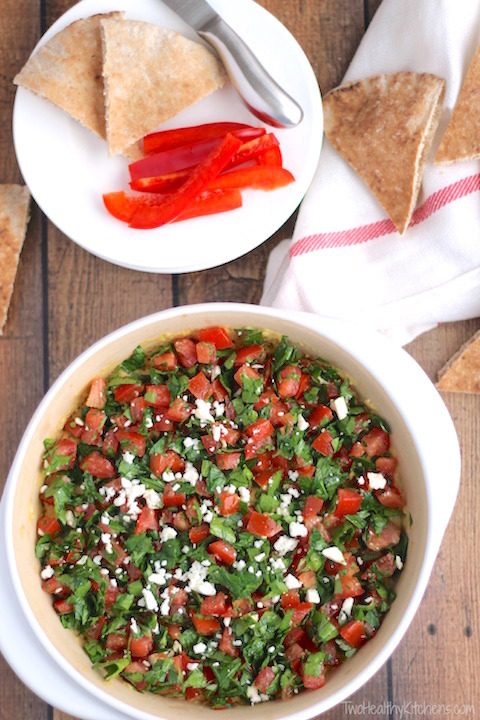 But we knew we wanted more than just baked hummus, all by its lonesome … we needed to get tabouli into the action, too! After all, we’d want to mix them all up together, anyway! 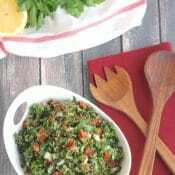 Ok, ok … we know that technically a true, honest-to-goodness tabouli (or tabouleh … or tabbouleh …) recipe would usually include bulgur wheat. But skipping the bulgur in our version allows this appetizer to be thrown together in just moments … so we’re pretty sure you’ll forgive us for adapting a bit. Plus, our simplified little riff still captures the flavors and fresh spirit of a classic tabouli – you really won’t miss the bulgur! Leaving out the bulgur also makes this hummus dip perfect for sharing with friends who are eating gluten-free. Everyone will love it! And we’re not kidding when we say this recipe is truly a s-n-a-p to make! Both layers can be prepped ahead of time and thrown together at the last minute! And while you certainly can bake the hummus in a standard oven, those shortcut lovers out there will find that it works just as well in a microwave. Double s-n-a-p! Gotta love those shortcuts! Psssst … and although we adore the juxtaposition of the warm hummus layer with the crisp-cool tabouli topping, this dip is still seriously fantastic once the hummus has cooled back down … or even when it’s served cold, straight out of the fridge. So no worries if you don’t have access to an oven. Take this to the picnic anyway! People will go crazy for it, no matter how you serve it! Really – we’ve seen it happen, and fended off the inquiries as everyone badgered us for the recipe! 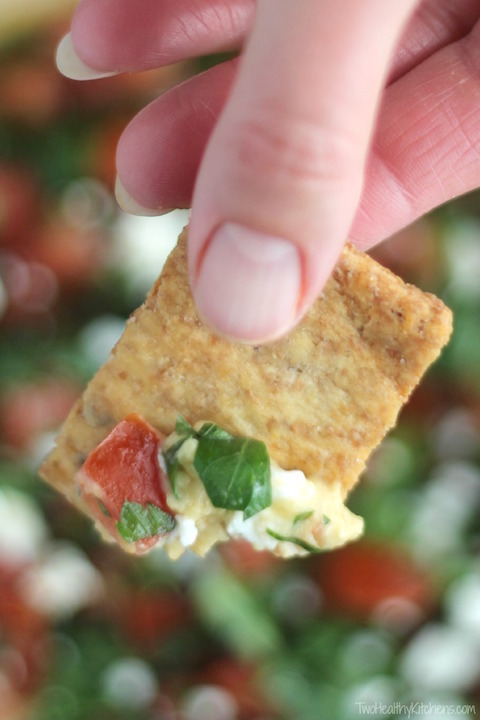 It’s so perfect when you’re celebrating … or when you need a quick appetizer for a last-minute party. And it’s also totally perfect for when you’ve just had a good day and need to give yourself a high-five. So really, it’s perfect all the time. It’s.perfect. 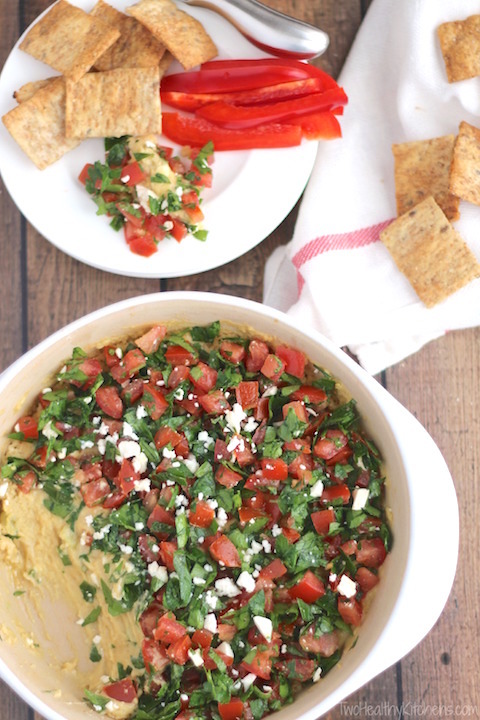 So let’s all party together with this amazing baked hummus dip. Let’s all sit around and talk about how A-MA-ZING you all have been to support us over the past two years! Seriously – you all are the best! Muah!! We can’t wait for the next two years. And the next five years. And the next ..
As long as we’ve got you along for our adventure, we know it’ll be SO fun! 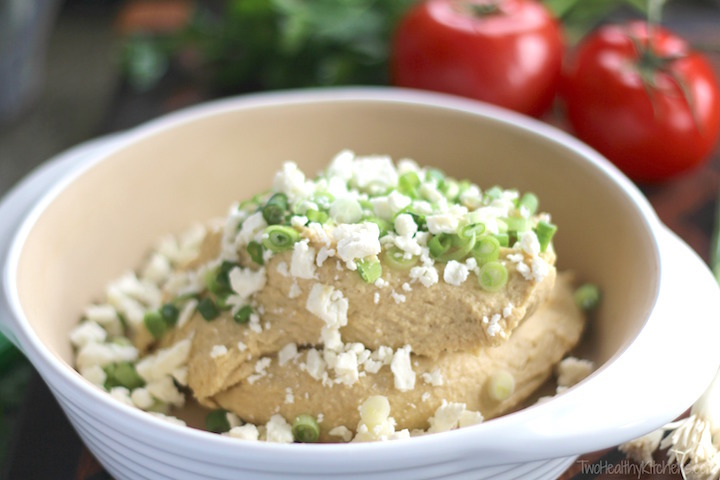 In an un-greased serving dish (such as an 8×8 baking pan, a small oval baking dish, or a pie pan), thoroughly combine hummus, ½ cup feta, and green onions. Bake at 350°F for 15-20 minutes (or microwave for about 4-5 minutes), stirring once halfway through, until hummus mixture is heated through and a bit bubbly and toasty at the edges. 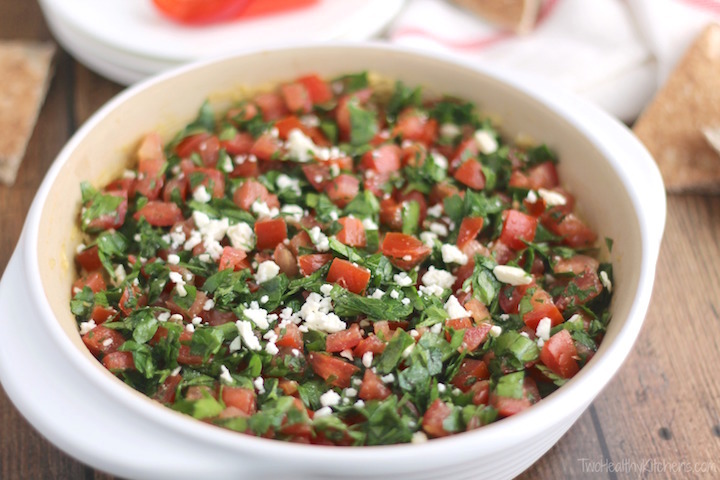 Meanwhile, combine tomato, parsley, 1½ tablespoons feta, olive oil, and salt in a medium bowl, stirring to combine. Top baked hummus mixture with tomato mixture. Serve immediately with whole grain pita bread, pita chips, or assorted veggies. Make-ahead tips: Both layers of this dip can be mixed up several hours ahead or even the night before. Cover and refrigerate separately until you're ready to bake the hummus and serve. 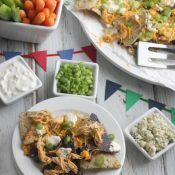 No-bake option: This dip is also completely wonderful served chilled, or once the hummus has cooled back down after baking – so don't worry if you don't have access to an oven to warm or rewarm this dip for a party or gathering. Looks delicious!! I will have to try this for sure! 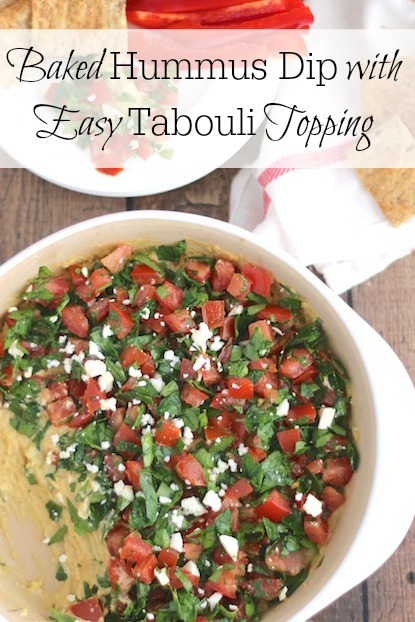 I love hummus, but I’m not sure if I’ve tried Tabouli yet…now I will have to. Looks delicious! I will be making this little dish this weekend for happy hour! Love both on their own separately and never have thought of combining the two! FANTASTIC! Can’t wait! Cheers! This is awesome- I don’t know when I never thought to combine tabouli and hummus- it sounds like a match make in heaven. Happy blogiversary! I think this is a perfect way to celebrate! I love dips! Happy blogiversary…blog-anniversary…blogimaversary! 😉 I’m glad I’m not the only one who mixes the tabbouleh/tabouli/tabuwhatever and hummus on my plate. I don’t think I’ve actually ever seen anyone do it. Now I can make this and force everyone to try it together! Muahaha! Anyway, I was just thinking that I don’t think I’ve ever had warm hummus before. Combining it with the cold tabu-stuff sounds genius! Congrats on making it to 2 years! It’s crazy how fast time goes by. ALso loving this recipe. Happy blogiversary, ladies!! 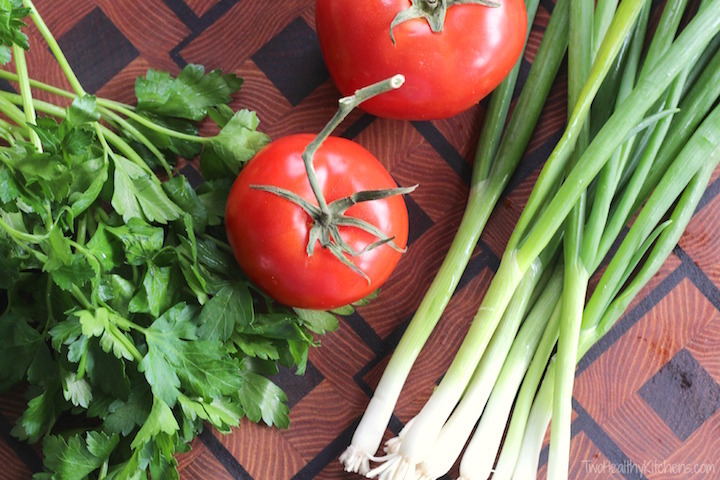 2 years of delicious, healthy foods — how awesome! Time sure does fly when you’re having fun! 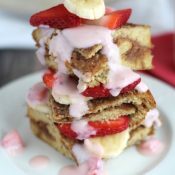 I absolutely love reading your blog and trying out your recipes (we have a lot of THK favorites now!). Here’s to many more years! Now that is my kind of recipe. Two of my favorite things ever. 🙂 Love the idea.